Fantastic Corona Jr will stand the 2015 season at Royal Vista Ranches, near Wayne, Oklahoma. WAYNE, OK�SEPTEMBER 3, 2014�Multiple G1-placed�top five Leading First Crop sire of Money Earners FANTASTIC CORONA JR will stand the 2015 season at Royal Vista Ranches near Wayne, Oklahoma. His fee has been set at $2,500. The seven-time Grade 1 performing son of Corona Cartel is out of five-time Grade 1 performing daughter of Strawfly Special, Special Queen SA. From a limited number of starters in his first crop to race he has sired seven winners and is the #4 Leading First Crop Sire of Money Earners. Among his starters are Grade 1 Ed Burke Million and Grade 2 West Texas Futurity finalist Phenomenal Jess ($45,923); Rocky Mountain Futurity finalist Sister Corona; Western States Breeders' Futurity finalist Phantastick; Firecracker Futurity finalist L Bar D Sweet Fantasy; Rainbow Futurity(G1) trial winner Poker Chip 831 (1 win in 1 start at 2), etc. The 8-year-old stallion earned $541,811 during his racing career defeating World Champion Stolis Winner and millionaire Tres Passes as well as Champion Brenda Beautiful and Grade 1 winner A Tempting Dash. Owned by Splenda LLC, Andreini, & Genco, FANTASTIC CORONA JR won or placed 14 of 17 starts and earned Grade 1 black type in the All American Derby, Los Alamitos Two Million Futurity, Los Alamitos Winter Derby and Southern California Derby. He also was a finalist in the Ed Burke Million Futurity G1, Los Alamitos Super Derby G1 and Vessels Maturity G1. 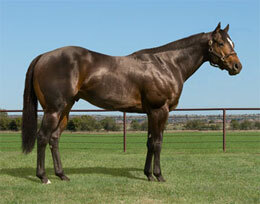 His dam, Special Queen Sa, won six races to earn $229,720. Second in the Grade 1 Ed Burke Memorial Futurity and Golden State Derby(G1), she is the dam of 8 ROM including stakes-placed Gran Special Sa ($48,370), Governor's Cup Futurity finalist Idol Special Dash ($37,810), etc. The second dam is stakes winner Queen Of Appeals ($83,988), by First Down Dash. She is the dam of 12 winners including AQHA Racing Champion Aged Stallion Good Reason SA ($1,446,727), Southern California Derby(G1) winner Jabuti Eagle SA ($92,141), stakes winner Appeals King Special SI 109 ($54,736), etc. For additional information or breeding contracts call Laura Wipf-Erickson at 405.449.7575.